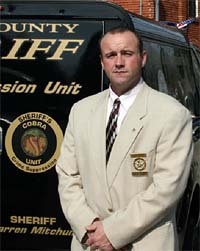 On behalf of the Twiggs County Sheriff’s Office, I would like to thank you for visiting our web site. I sincerely hope the information contained within this web site will provide you with a better understanding of how your Sheriff’s Office operates. It is our desire to be the best possible law enforcement agency in Georgia, and we want to do all we can to serve your needs. I encourage you to contact me or any of my staff if you have any questions or if you have any suggestions that will help us better serve our community. The men and women of the Twiggs County Sheriff’s Office believe that it is our fundamental duty to serve and protect the citizens of Twiggs County with fairness, compassion, and respect. I expect my staff to perform their duties with integrity in a professional and timely manner, so that those we serve may feel secure. I am committed to providing equal service and protection under the law for everyone, without prejudice and favor.